Thousands of demonstrators have rallied in the Syrian city of Homs, activists said, as Arab League peace monitors arrived in the protest flashpoint. The observers are verifying compliance with an Arab League peace plan that requires an end to the violent crackdown on anti-government protests. Activist said tanks withdrew from Homs hours before the observers arrived. The UN says more than 5,000 people have been killed since anti-government protests began in March. Activists said at least 30 people were killed in Homs on Monday as government troops shelled parts of the city. But they said the shelling stopped overnight and some of the tanks pulled out of the city early on Tuesday, shortly before the Arab League monitors arrived. 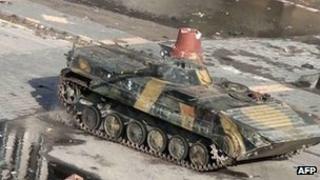 The London-based Syrian Observatory for Human Rights said more tanks remained in the city, hidden inside government buildings. The BBC's Jim Muir, in neighbouring Lebanon, says Syrian armed forces have made a show of withdrawing from protest flashpoints in the past, only to return when protests resume. Syria's al-Dunya television, a privately-owned channel, said the Arab League observers were meeting the governor of Homs province. As the observers arrived in Homs, the Observatory said as many as 30,000 people staged a demonstration there. Some reports put the figure far higher. Baba Amr and other parts of Homs had come under heavy shellfire on Monday. Residents said many buildings had been destroyed and government snipers had made it impossible to search for survivors. The mission is getting under way in earnest now. Syria has said it is responsible for the security of the Arab observers, so it remains to be seen how free their access to trouble spots will be. The head of the Arab League, Nabil al-Arabi, has said it will take about a week to judge whether Syria really is complying with the agreement it signed, under which the observers are to monitor a complete halt to the violence, the withdrawal of armed forces, and the release of all detainees, of whom there are many thousands. In advance of the observers' arrival, activists accused the authorities of moving detainees onto military bases - where the observers are not allowed to go - and also of removing hundreds of bodies of killed protesters from the morgue at Homs. Video footage sent to Reuters news agency on Tuesday and posted on YouTube appeared to show residents arguing with monitors, trying to get them to go further inside the Baba Amr district. Gunfire can be heard in the background. Footage has also been posted on the internet purporting to show the aftermath of the earlier heavy shelling in Baba Amr. It shows the bloodied corpses of four young men and a woman screaming for help from the international community. The Observatory said 18 people were killed in Baba Amr on Monday and another 11 killed elsewhere in Homs. One woman was killed in nearby Talbisseh, the Observatory said. Casualty figures are hard to verify as most foreign media are banned from reporting in Syria. The Syrian government says it is fighting armed gangs and that hundreds of members of the security forces have been killed as well. Large numbers of army deserters are reported to have joined armed rebels in the Free Syrian Army in recent weeks to launch attacks on pro-government troops. "The violence is definitely two-sided," one Homs resident told Reuters. "I've been seeing ambulances filled with wounded soldiers passing by my window in the past days. They're getting shot somehow." The observers' mission is to assess an Arab League initiative agreed with the Syrian government requiring all armed forces to withdraw from areas of conflict. Damascus has pledged to allow the monitors full freedom of movement, but they will depend on the regime to provide transport and security. The head of the mission, Sudan's Gen Mustafa Dabi, said the Syrian authorities were being "very co-operative", AFP news agency reported. But the leader of the Syrian National Council (SNC), the main umbrella group of opponents to President Assad, said the observers were "being held prisoners by the Syrian system". Burhan Ghalioun, who is based in Paris, told reporters: "We ask for the Arab leaders who designed this plan to intervene and make the Syrian regime stop this massacre." He also called on the UN and European leaders to intervene, saying the League's plan was good but that it did not have the power to enforce it. Our correspondent in neighbouring Lebanon says Homs may well prove to be a test case for the observer mission in terms of ascertaining whether they truly have unrestricted access and whether there is any peace for them to monitor. The observer mission will eventually have up to 200 members. It plans to meet both government officials and the opposition. Syrian Foreign Minister Walid Muallem has said he expects the monitors to back the government's claim that armed gangs are behind the continuing violence.